Photo by BBaunach via Creative Commons. 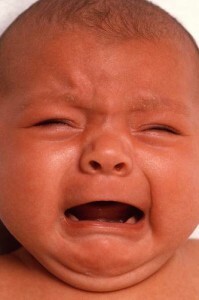 A baby’s cries can take more than milk or a diaper change to soothe. Persistent crying could be sign of infant headache. Diagnosing headache is challenging since babies lack the words to communicate their pain. A 2009 study demonstrates how chiropractors can diagnose and treat infant headaches. The study included 13 infants under chiropractic care who exhibited signs of infant headache. Doctors relied on parental reports, familial history, and behavioral signs to diagnose pain. Babies were suspected of having headaches when they had episodes of head holding, head banging, grimacing or withdrawal from feeding, or sensitivity to light. In cases where cervical spine dysfunction was present, chiropractors treated babies with special, low-force adjustments. Treatment also consisted of giving infants low doses of antidepressants and consoling parents on the benign nature of head pain. Infant headaches could derive from a number of sources. Familial history likely contributes to infant headache. Some parents in this study said they were able to recognize behavioral signs of headache in their child based on their own experience with head pain. Another potential source of head pain is birth injury. Many infants in this study had difficult or assisted births that could have caused injury to cervical spine (neck) or temporomandibular joint (TMJ) in the jaw. Significant force on the cervical spine during birth has been shown to produce neurological effects in infants, and may be associated with head pain. Just as adults with TMJ disorders have difficulty opening and closing their mouths, infants with TMJ disorders may experience pain when opening their mouths to breastfeed. Although the exact causes of infant headache are difficult to discern, identifying and treating head pain early on could help children avoid a lifetime of chronic pain. Marchand AM, Miller JE, Mitchell C. Diagnosis and Chiropractic Treatment of Infant Headache Based on Behavioral Presentation and Physical Findings: A Retrospective Series of 13 Cases. Journal of Manipulative and Physiological Therapeutics 2009; 32 (8): 682-686. Written by: Michael Melton on June 19, 2012.Modified on May 31, 2013.